Throughout June, cities around the country have been celebrating with festivals, parades, parties and picnics. But pride celebrations are more than a great excuse to gather with friends and family and share a toast. 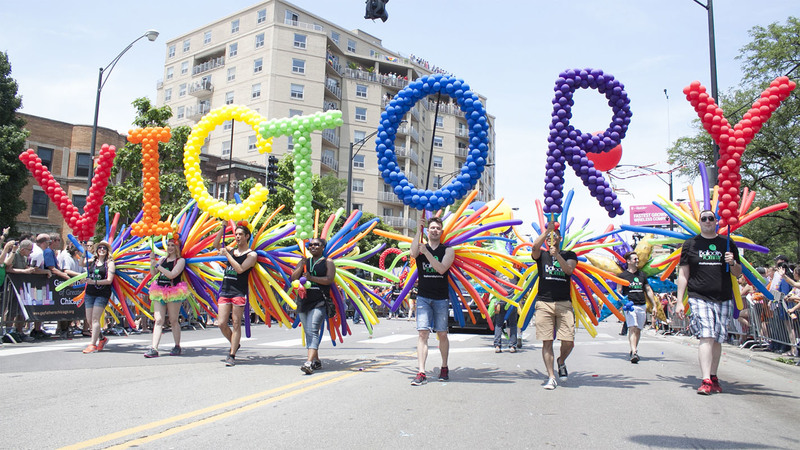 Throughout recent history, they have played a major role in pushing for the creation of LGBT rights legislation. The origin of American pride parades can be traced back to 1970. Rather than a parade, New York, L.A., Chicago, and San Francisco held somber marches in remembrance of the Stonewall Riot a year previously. The riot is widely cited as the beginning of the modern LGBT movement in the U.S. It occurred when the iconic NYC gay bar, ‘the Stonewall,’ was raided by the police, and the patrons bravely fought back. At the time, the LGBT community regularly faced violence and harsh discrimination. Being non-heterosexual was classified as a ‘mental disorder,’ and it was often unsafe to be openly gay. As marches began to appear in other cities, they opened up a national dialogue about what was then known simply as “gay rights.” This resulted in some progress (such as the declassification of being gay as a mental disorder in 1973), but also pushback, such as several states legally defining marriage as between one man and one woman. Marches often focused on local legislation. At the 1978 Los Angeles march, for example, participants protested the Briggs Initiative, which would have made it illegal for a non-heterosexual person to work in public schools throughout California. When HIV/AIDS began to spread throughout the country in the 1980’s, the population of gay men was hit hard. Many marches demanded more research and better treatment for those affected. For example, the 1990 march in L.A. had a “die-in” where participants laid on the ground to represent their community members killed by the disease. But there was also some good news. The nearly two decades of marches had played a role in shifting America’s attitudes on LGBT rights, and several states began to create anti-discrimination laws, beginning with Wisconsin. By the mid 1990s, pride gatherings in June were the norm in most major cities. The tone also began to shift, from political marches to light-hearted celebrations. It was a sign of the progress made that more people could publicly ‘come out,’ facing less violence and discrimination. There was also an increase in attendance by families, as it became safer for LGBT folks to openly raise children, whether through adoption, birth or surrogacy. During the 2000s, battles at local, state, and national levels were being fought for marriage equality. Pride parades were utilized to educate the public, generate support, and encourage lawmakers to vote in favor of LGBT rights. For example, after Proposition 8 banning gay marriage in California was passed in 2008, pride parades in following years focused heavily on reversing the decision and establishing the right to marry. This year, we’re seeing many parades address the rights of transgender and gender non-conforming individuals, who have recently faced major threats to their rights and safety. That said, pride celebrations today tend to be more of a simple celebration, rather than strong political statements. But that doesn’t mean they don’t have a significant effect on policy, as we’ll see below. Pride parades are a chance for individuals, businesses, organizations, and even entire cities to show their support of LGBT rights. The importance of this public display of solidarity cannot be underestimated. When those with power show advocate for equality, they encourage others to do the same. This begins to evolve the status quo, and changes what is seen as ‘normal’ or ‘acceptable’ in a culture. They also demonstrate to lawmakers that the public is in support of LGBT rights, and that they should take heed of the opinions of their constituents. What is particularly special about Pride parades in recent years, however, is that they flip the negative narrative that focuses on rights being denied, and instead celebrate what is positive. They are joyous occasions, full of music, dance, and laughter. For a group of people that has systematically been marginalized, this infusion of positivity plays an important role. Perhaps, one day, we won’t need pride celebrations, because the LGBT community will be as fully accepted as the straight community. Until then, they are an important tool, not only to encourage political change, but also to create a sense of inclusion, safety, and joy. The Gay Family Law Center is proud to have supported our community throughout the years. We raise a toast to many more years of celebrations.